Does not mark tissue. Needle points impact the bone structures for positive support invaluable in difficult cases. This support has three needles. The bottom two sit against the collar bone. While the upper one is applied against the chin. Each needle has its own screw-on cover. 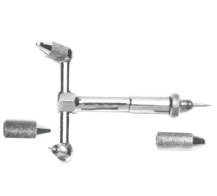 The top needle is adjustable to compensate for the differences in individual subjects. Gives positive support and can be used with or without head blocks.